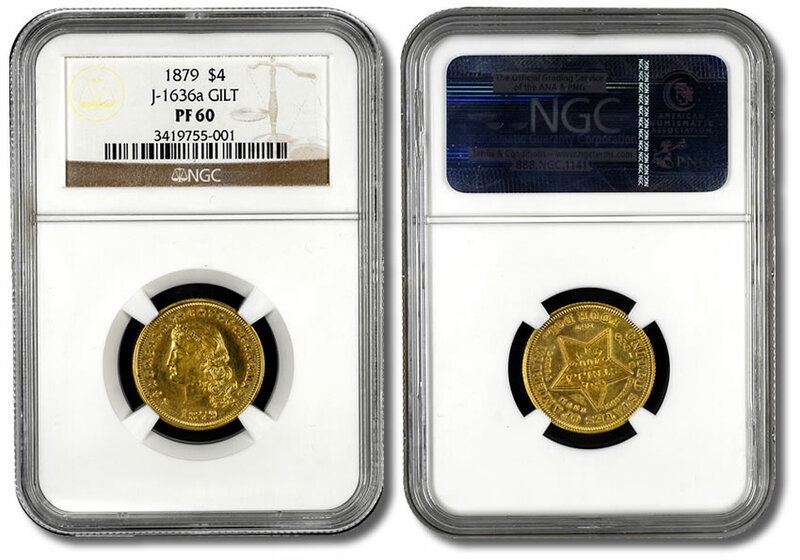 Numismatic Guaranty Corporation (NGC) has authenticated and graded the single known example of a distinctive Stella variety as PF-60, J-1636a. The Stella, or four-dollar gold piece, was coined solely as a series of pattern pieces dated 1879 or 1880 in two major types. Both show a left-facing bust of Liberty on the obverse and a five-pointed star on the reverse, from which the coins get their popular name "Stella." More often seen is the Flowing Hair type designed by Mint Engraver Charles Barber, with most examples bearing the 1879 date. This newly-certified specimen features that same basic design, but what makes it unique is that the bust of Liberty is positioned differently with respect to the supporting design elements, clearly identifying it as having been struck with a different obverse die than all other known examples. The reverse die is the same as that observed for other Stellas coined in gold, copper, aluminum and white metal. The coin was struck in copper and gilt-gold plated. Whether this gilding was done at the U.S. Mint or sometime later is not certain. 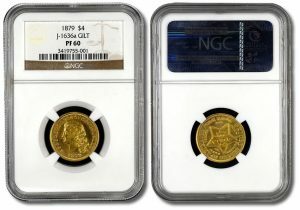 NGC, the world’s largest and most respected third-party coin grading service, was founded in 1987. From the beginning, NGC has committed itself to developing an impartial, trusted standard of consistent and accurate grading. To uphold this commitment, NGC’s full-time grading professionals are no longer active in the commercial coin marketplace, and are prohibited from buying or selling coins to ensure impartiality. As NGC has grown to become the leader in third-party grading services, we have maintained a steadfast and uncompromising commitment to this standard. NGC is a trademark or registered trademark of Numismatic Guaranty Corporation in the United States and/or other countries. All other names and marks referenced in this release are the trade names, trademarks, or service marks of their respective owners.